Adjustable height stool. Square metal base. Steel column with rectangular metal footrest. Gas piston. Seat and back made metal "belt" on edge. Padded cushion upholstered with fabric or leather. Glides in low attrition plastic. Base powder coated in matte black, white or satin aluminum (standard) or with stainless steel cover. 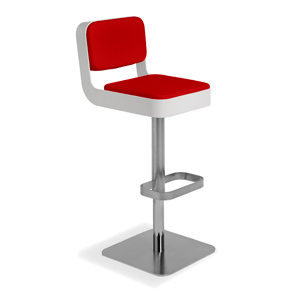 Column and footrest available in polished chrome, satin chrome, or powder coated matte black, white or satin aluminum. Seat "belt" powder coated in matte black, white or satin aluminum (standard) or red. Seat Height: 21¾" - 32"
Stainless steel base cover - $37. Please specify base, footrest/column, seat belt color when ordering.